Katsuhiro Otomo (大友 克洋, Otomo Katsuhiro) is a Japanese manga artist, film director, and screenwriter. He is perhaps best known for being the creator of the manga Akira and its anime adaptation, which are extremely famous and influential. Otomo has also directed several live-action films, such as the recent 2006 feature film adaptation of the Mushishi manga. Katsuhiro Otomo was born in the former town of Hasama, in Miyagi Prefecture. As a teenager growing up in the turbulent 1960s, he was surrounded by the demonstrations of both students and workers against the Japanese government. The riots, demonstrations, and overall chaotic conditions of this time would serve as the inspiration for his best known work, Akira. Some would argue that this sem Katsuhiro Otomo (大友 克洋, Otomo Katsuhiro) is a Japanese manga artist, film director, and screenwriter. He is perhaps best known for being the creator of the manga Akira and its anime adaptation, which are extremely famous and influential. 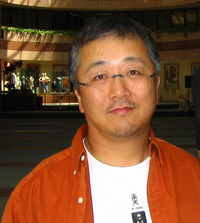 Otomo has also directed several live-action films, such as the recent 2006 feature film adaptation of the Mushishi manga. As a teenager growing up in the turbulent 1960s, he was surrounded by the demonstrations of both students and workers against the Japanese government. The riots, demonstrations, and overall chaotic conditions of this time would serve as the inspiration for his best known work, Akira. Some would argue that this seminal work is an allegory of 1960s Japan, and that one could easily substitute the year 2019 for 1969 and leave little difference in the basic story. The animation from this period (especially the works coming out of Tokyo animation studios Mushi Production and Toei Doga, now known as TOEI Animation) were influencing young Otomo. Works like Tetsujin 28-go, Astro Boy, and Hols: Prince of the Sun would help push Otomo toward a career in animation. However, it was the films coming out of America that were driving his rebellious nature. Five Easy Pieces and Easy Rider would serve as inspiration for Shotaro Kaneda and his biker gang in Akira: rebellious youth who took too many drugs and didn't care about authority or the pressures put on them by their parents' generation. Otomo has recently worked extensively with noted studio Sunrise with the studio animating and producing his most recent projects, the 2004 feature film Steamboy, 2006's Freedom Project and his latest project, SOS! Tokyo Metro Explorers: The Next, released in 2007. Which of these books would you like to be our 9th Group Read Discussion (September 2012)? The winning pick will be our official 9th Group Read Discussion. The 2nd place finisher will have an optional discussion thread. Is this you? Let us know. If not, help out and invite Katsuhiro to Goodreads.